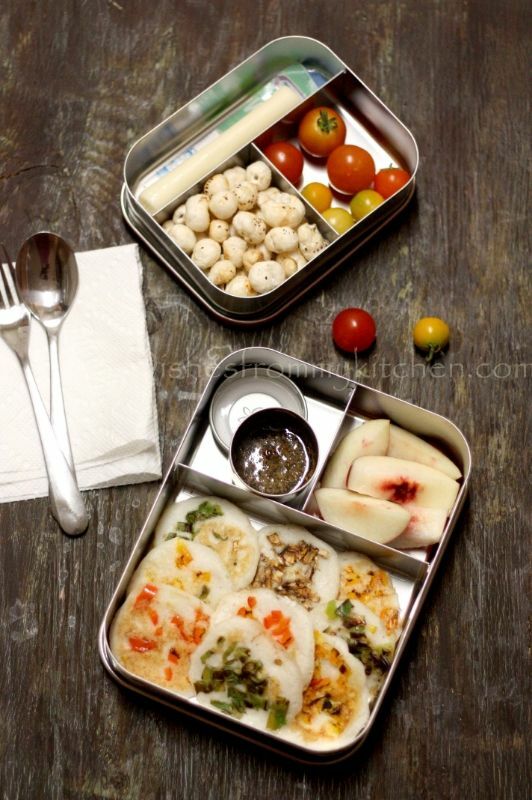 Dishesfrommykitchen: KIDS LUNCH BOX - MINI COLORFUL UTTAPAMS/DOSAS ! 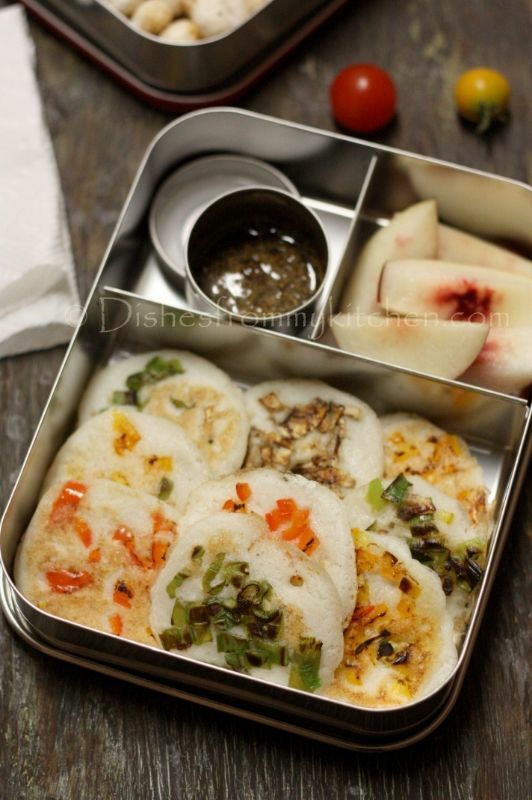 LUNCH BOX : MINI UTTAPAMS/OOTHAPPAM , CURRY LEAVES SPICE POWDER TO GO WITH UTTAPPAM, NECTARINES ! 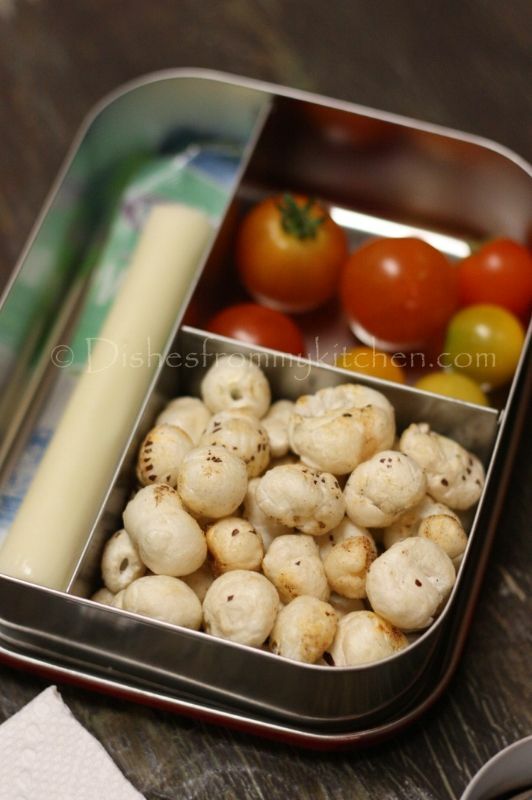 SNACK BOX : CHAATPATTA PHOOL MAKHANA/LOTUS SEED, HOME GROWN CHERRY TOMATO, STRING CHEESE FOR SNACKING ! I used little of red bell peppers, yellow peppers, orange bell peppers, mushrooms, spring onion. Chop each of finely and mix with little salt and pepper and keep it aside. 1. Heat the skillet, pour the batter to small circles up to 5 or 6 depends on the skillet size. 2. Top it with the above topping in each one of the circles. 3. Drizzle oil and when slightly browned on the underneath flip it over and roast on other side. There are umpteen number of topping you can make for the lunch box, depends on your kids liking. Go with your imagination. 1. Heat 1/2 tsp of oil add Phool makhana (2 heaped cups) and fry in the low flame until they are crispy. 3. Add 1/4 tsp of coconut oil or ghee(add this 1/4 tsp of black salt, 1/8 tsp pepper, 1/8 tsp chilli powder, 1/8 tsp chaat masala, pinch of turmeric to oil) , immediately add the phool makhana and mix well so that it coats well like we do puffed rice. 4.Don't keep in the flame for long time as it shrinks.. just warm enough. 5. Then you can eat like snack. 6. You can also make this in large batch and store in the air tight container.